Anyone who’s been stung by a bee knows they can inflict an outsized pain for such tiny insects. It makes a strange kind of sense, then, that their demise would create an outsized problem for the food system by placing the more than 70 crops they pollinate — from almonds to apples to blueberries — in peril. Although news about Colony Collapse Disorder (CCD) has died down, commercial beekeepers have seen average population losses of about 30 percent each year since 2006, said Paul Towers, of the Pesticide Action Network. Towers was one of the organizers of a conference that brought together beekeepers and environmental groups this week to tackle the challenges facing the beekeeping industry and the agricultural economy by proxy. “We are inching our way toward a critical tipping point,” said Steve Ellis, secretary of the National Honey Bee Advisory Board (NHBAB) and a beekeeper for 35 years. Last year he had so many abnormal bee die-offs that he’ll qualify for disaster relief from the U.S. Department of Agriculture (USDA). 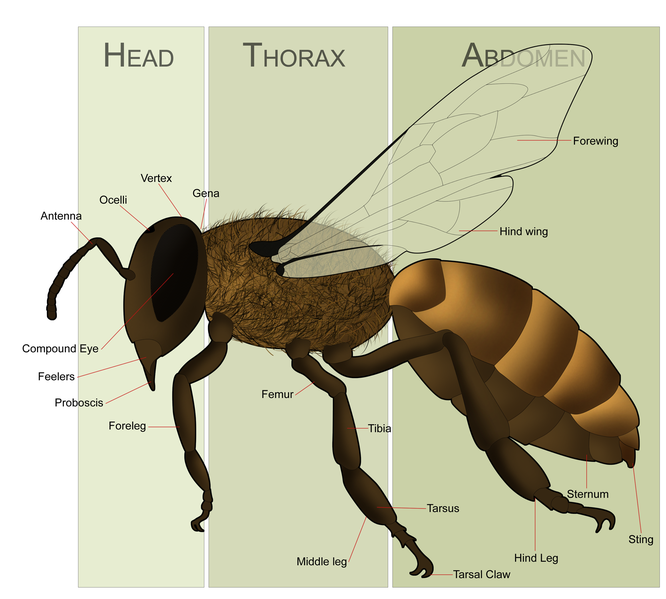 38,000 years ago humans were making wine from the bees bounty. 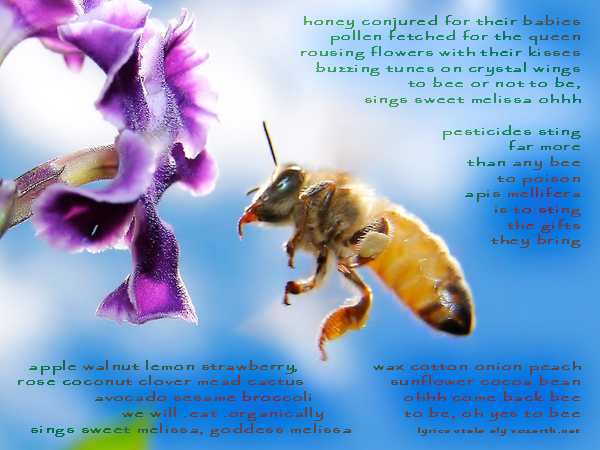 Zeus's daughter melissa was the goddess of the honey bee. As the Greeks and Romans embraced cultivated Europe, the norseman carried on the tradition of honey wine. Sacred ceremonies by the light of beeswax candles. Work hard, bee a team player, care for our young, pamper our queen and do what needs to bee done. Fans :: Donate $1 or more to sponsor a better version of this song. Donate $44 or more to get a shared copyright certificate for this song or your choice of one of our other environmental songs. As bees are endangered by the use of neonicotinoids and other harmful chemicals in the environment, and I am aware of these dangers, I pledge to help reduce the amount of these poisons in the environment by adhering to the level or levels of care described below. Level 3: Bee-Friendly (Best! ): I will not use any poisonous chemicals outdoors AND I will plant and raise plants that provide the pollen and nectar that bees and other pollinators need. Level 2: Organic (Better): I will not use any poisonous chemicals or products outdoors. Jeff & Paige bring science and nature to life through kid-delighting music and stories. If you are concerned about the decline in bees around the world and are planting a bee garden to provide pollen and nectar: stay away from fancy plants. A team from Leeds University studied 24 gardens over two years and discovered that affluent gardens have less bees visiting them than working class gardens. This came as a surprise to them because they expected the higher plant diversity in affluent gardens to attract more bees. 1. Stop using insecticides. 2. Avoid seeds coated with insecticides. 3. Read labels on garden compost. Some garden composts contain imidacloprid 4. Plant bee-friendly plants. 5. Create natural habitat gardens. 6. Become a beekeeper. 7. Buy local honey. 8. Make you own ‘wild bee’ house. Last year, leaked documents exposed the U.S. Environmental Protection Agency’s (EPA) illegitimate approval of clothianidin, a highly-toxic pesticide that the regulatory agency knew was capable of killing off bees. Also, a new study out of Purdue University confirmed, once again, that clothianidin is killing off bees, but also that clothianidin’s toxicity is systemic throughout the entire food chain. Hi Howard, Right on. We need more songs for the bees if you want to help me write one. I sooo wayyy wanna write another song to help protect the bees. Queen of the Sun and Colony Collapse Disorder could be in the song. "Half of all the honey bees on the planet have died in recent years. A startling fact when you consider not only the impact that this has on the food chain and our food supply, but the even deeper metaphor that this represents for our culture. 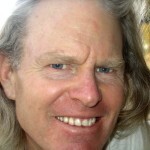 The disappearance of the bees has been named “Colony Collapse Disorder” and one well known bio-dynamic bee keeper featured in the new film by Taggart Siegel, Queen of the Sun, commented that actually the bees are showing us that this disorder is our own. cool. a song for bees; about bees. i also think it is good/nice to try to save species however isn't natural selection about species being able to weather all that is thrown at them including man? you might be better informed just trying to educate these dumb people who destroy forests and fishermen who deplete fish stocks… americans in new england, western europeans in the atlantic and mediteranian etc. people are mostly responsible for endangered species. a little education might go a long way to presserve them. personally i think there are just too many people in the world today and what is really needed is massive birth control and if that means fewer religions then that is ok. i mean religion and superstition are the same thing.